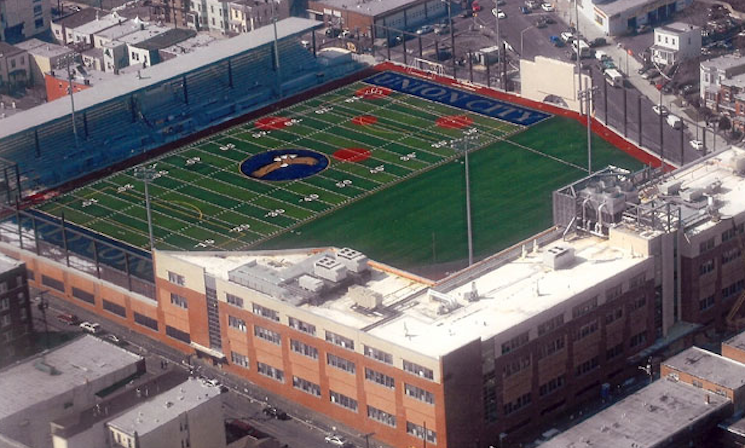 What does a school district do for fields when it has to make do with one four-story building for its high school, surrounded by the most dense urban area in the United States? It puts them on the roof. 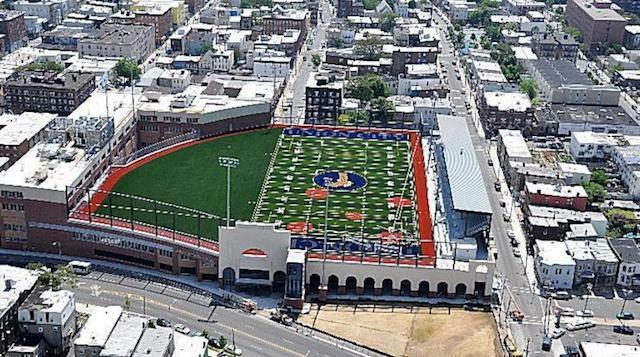 The photos you see here feature Union City (N.J.) High, which may have the most innovative field design in the nation. 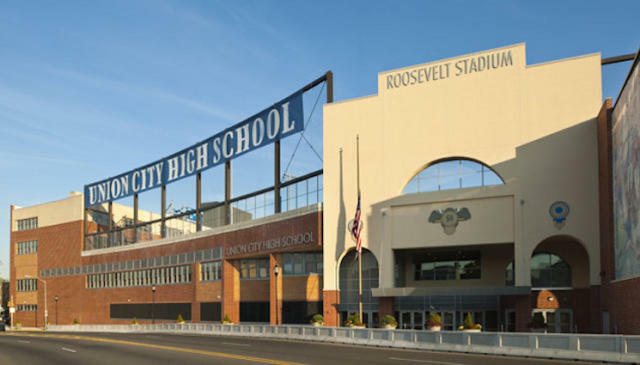 When the Union City Independent School District decided to use the site of the existing Roosevelt Stadium to house a new, combined Union Hill (Union City) and Emerson (Union City) High School, the district had to find somewhere for its sports teams to play. The answer was hosting the teams on the same geographic site they always had, just up in the air. Officials designed plans for a $15 million artificial turf facility that seats 2,500 fans and can host football, baseball, soccer, field hockey and any other sport that requires a field. 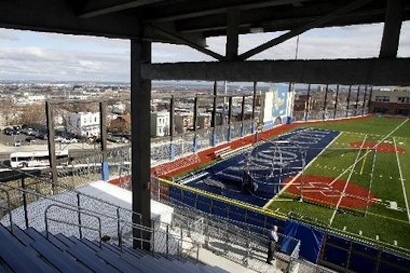 It has since been dubbed the "Eagles Nest" in honor of the Union City mascot. According to a MaxPreps profile of the facility, the largest snafu since the elevated field was opened in 2009 was brought on by a playoff game in 2011. The issue? There were too many fans who wanted to attend, leaving some 1,500 would-be spectators walking around the streets below the field. As for prospective lost footballs and baseballs, there are 40-foot nets behind each end zone that catch balls before they reach the street. As of 2012, only two footballs and one soccer ball have been lost, though a handful of home runs have also cleared the facility’s boundaries.